In 2018 the next volume of of the Springer Book Series “Translational Systems” will be published by Dr. Jennifer Wilby, Julie Billingham, David Rousseau and BCSSS Managing Director Stefan Blachfellner, all leaders of the BCSSS Research Group “Systems Science and Philosophy”. With the heading “General Systemology. Transdisciplinarity for Discovery, Insight, and Innovation” the authors intend to provide an integrated perspective on the many-sided interrelationships between General Systemology, Translational Systems Science, and the wider field of Systemology. It offers the reader insight into recent advances in the development of General Systems Theory, the General Systems Worldview, and General Systems Transdisciplinarity. 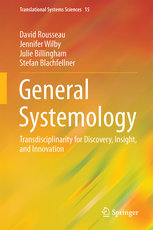 General Systemology is a transdiscipline that enables scientific discovery, insightful theory building, and practical innovation in all the disciplines that study, design, or employ complex systems.